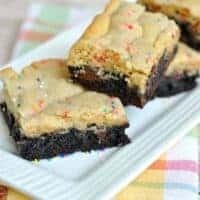 Soft, chewy Sugar Brookies are a delicious combo of Sugar Cookies and Brownies. 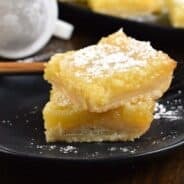 Make a pan for dessert today! Hey friends! It’s Aimee. Coming to you from Illinois. Our move went smoothly. I forget how much work it is to unpack though. And sadly, I think I have less cabinet space at this new house! It’s like a puzzle trying to figure out what will be stored where. And then I switch it around. I think I’ve rearranged my cabinets 4 times. But, now I’m pretty sure I know where everything is. So much so, that I whipped up these Sugar Brookies the other day. 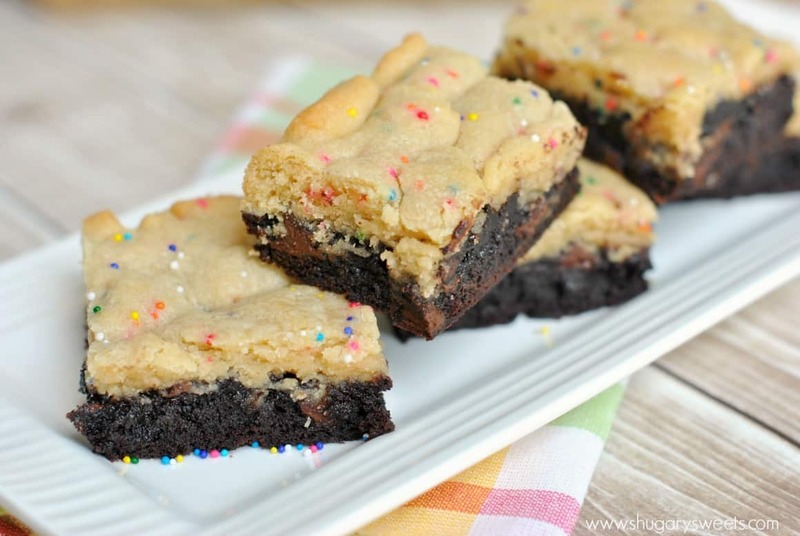 If you recall, brookies are a combo of cookies + brownies….a delicious combo if you ask me! 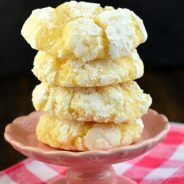 Scroll down after the recipe and you’ll see I’m a bit obsessed! Today’s recipe was inspired by the insane amount of sprinkles I unpacked. One whole cabinet of sprinkles. Priorities, right? And, can I just say that I’ve typed SHUGAR (not SUGAR) twice now. It’s a problem I have. I know how to spell sugar, honest. As a reminder (I’m asked frequently) SHUGARY is a play off my last name. Which is fun and perfect for blogging….not so great when you need to write the word SUGAR and you want to stick an H in there every time! Ha. As for these Sugar Brookies…they are obviously a combo of sugar cookies and brownies. And sprinkles, of course. You can use a boxed brownie mix for the bottom layer if you prefer, I enjoy this easy, one bowl from scratch recipe below. And they end up being so moist and fudgy. Also, these are REALLY good on day 2. Dare I say I think they may even taste better! Crazy how that is sometimes, right! Line a 13x9 baking dish with parchment paper. In a large bowl, combine brownie ingredients. Blend with a wooden spoon just until combined. Spread in bottom of baking dish. 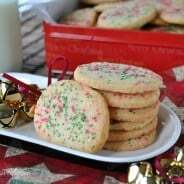 For the cookies, beat softened butter with sugar and vanilla until blended. Add egg and combine. Add flour, baking powder and salt and mix until fully combined. Fold in sprinkles. Drop by spoonful over brownie layer, trying to keep the cookie layer evenly spread. Bake in a 375 degree preheated oven for 25-28 minutes. Remove and cool completely. Cut and enjoy. Store in airtight container at room temperature up to 5 days. The original Chocolate Chip Brookies. A perfect recipe! 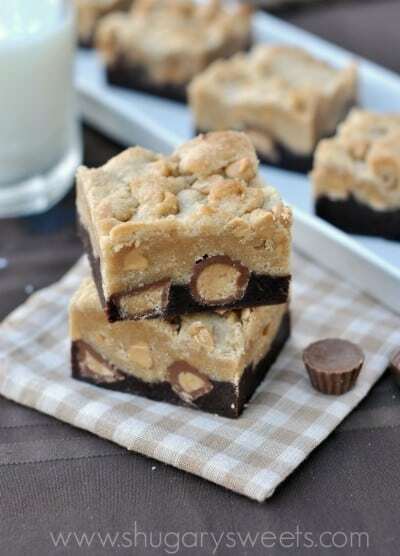 Peanut Butter Brookies. Of course a few Reese’s minis make everything even better! Now I don’t have to choose between two of my favorite deserts! Don’t know if any would last till the second day though. 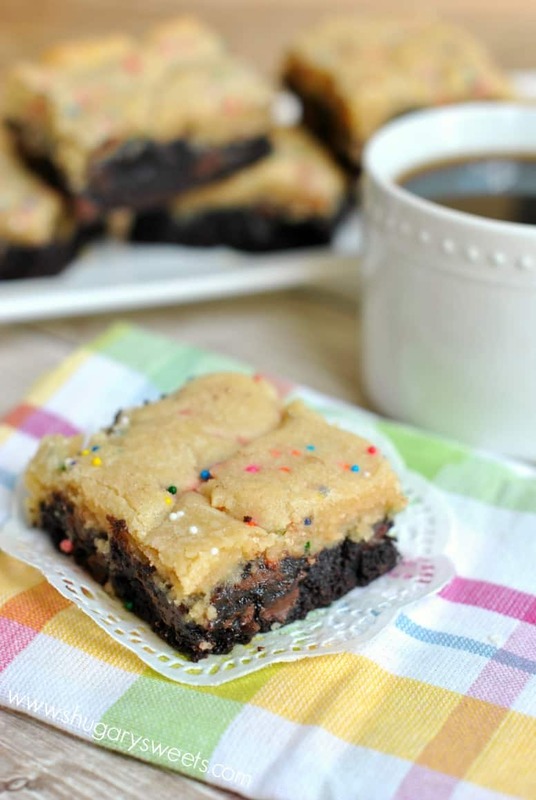 Mmm…I love this contrast sugar cookie against brownie. Bet it’s delish! Hope you have an awesome weekend Aimee! I am currently eating a bowl of oatmeal and wishing it was one of these. Remind me to never visit your blog before breakfast. Cookies and brownies? I. Am. Dead. Pinned! Is that a cup of coffee in one of your pics?! I think my coffee this morning is definitely needing one of these sugar brookies! Good luck with all the unpacking. I just moved a few states from CA to TX about 3 weeks ago…I’m still unpacking. The only thing done is the kitchen! My cup of coffee makes it into most of my pictures, hehe!! Moving is tough right? I thought packing was hard, but I think unpacking might be worse! Brookies are my favorite food group. These are fantastic honey! I’ve never had a brookie. I really need to change that. Brookies? I’m in love! 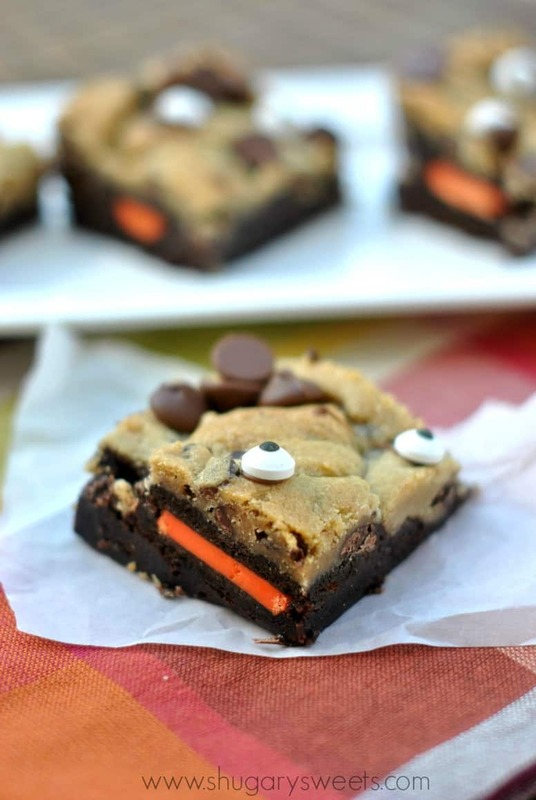 Oh, and my niece is named Brooke and we call her Brookie all the time…I’m SO making these for her! Perfect treat for your niece! How FUN are these?? I’ve only ever made the chocolate chip cookie kind. I see a peanut butter brookie in my future, too! Extra chocolate is always good, right? Don’t hold back! Rearrange your cabinets as much as you need to! It’s gotta be right, or you’ll spend the next years of your life cursing the day you decided to put the cereal bowls ever so slightly out of reach. 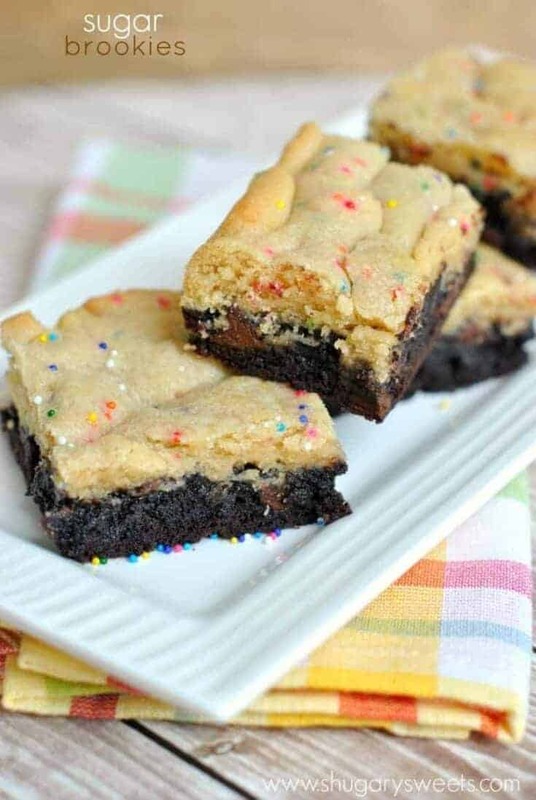 These brookies are a great way to inaugurate your new digs! Oh my goodness, I SO need to start using my insane amount of sprinkles, too! These look so fun and yummy! Haha, glad I’m not the only sprinkles hoarder! So glad your move was a success Aimee! These brookies are genius – love those contrasting layers! My favorite brookies yet!!! Glad you’re getting settled! Thanks Dorothy. Moving is hard when you’re a blogger and need to be online and in your kitchen, and everything is packed. But things are finally coming along around here!! yay! so happy you’re settling in! these look so wonderful! I love this combination! Yeah for the successful move! This definitely calls for sprinkles. And quite possibly the best brookies ever! Mmm they look incredible! Wow! this looks so delicious! and very festive! Brookies! I love it! Brownies and cookies are my two favorite desserts so putting them together is a no brainer! They look delicious! Mine did not stay layered the brownie bubbled up through the cookie part to become marbled, should still taste good I hope any ideas. Hmmm, that shouldn’t happen. The brownie layer and cookie layer have always stayed separate for me! Not sure why that happened for you. I had difficulty getting the brownie part to sit up….not that I don’t mind gooey, but these were borderline soupy on the bottom. I baked them for 28 minutes at 385, and even put them back in for 7 minutes after waiting an hour for them to cool. I was hoping to give this batch to welcome some new neighbors, but I think I may have to have a re-do. Any suggestions? 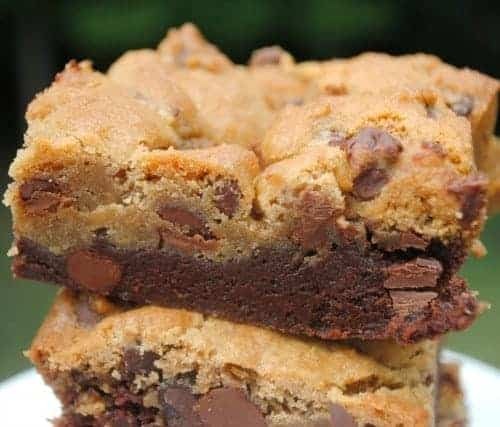 As other reviewers pointed out, the brownie is a bit too gooey, probably because the recipe doesn’t call for any leavener (baking soda or powder). The cookie part is a bit tricky to spread evenly on top of the brownie batter. I placed a dollop evenly distributed and then gently spread each one out. I prefer my brownies undercooked, and the cookie part will spread itself if you “dollop” it on top. I also like to refrigerate this after it’s cooled, before cutting. Firms things up a bit 🙂 ENJOY!